Monday, February 14, 2011. Broke ground from home base at Sentani five minutes after the airport opened. Landing at Eipomek an hour later, the sun had yet to penetrate the tight little valley and the airstrip was still in the shadows. I met my friend Andrew there at the top of the airstrip. The plan for the day is to move him to the village of Okbap, with a stop in Omban along the way--both airstrips in the Ketengban territory. I need to pay more attention to my cargo manifests. Beyond the four passengers I had from Sentani, I didn't actually know what I had on board the airplane in terms of cargo until we were off-loading in Eipomek. Turns out I had a couple of kings in the airplane. About a dozen boxes with no labels on them...they held the first portions of the Old Testament to be translated into the Ketengban language: 1 & 2 Kings. We loaded back up and headed over to Omban. Heading east, we're straight into the early morning sun that brilliantly illuminates the cloud deck below us. I never get tired of the views this office affords. Fifteen minutes later we're flying the amazing approach in the Omban valley. We're here to drop off some of those boxes--freshly printed scriptures for distribution to the churches in the area. Andrew also wants to check out his house--he hasn't been 'home' for a while and will be coming back here with his wife Anne in a couple of weeks. I had also brought a patient with me from Sentani, to return to his home in Omban. Andrew overheard the men talking--having spent over 25 years working among the Ketengban, he's fluent in the language. He caught enough of the conversation to have his Spirit-led alarms start ringing. Apparently, a doctor out in town told our patient, a young man in his 20's, that he couldn't help him and that the illness he had was caused by someone putting a curse on him. The doctor's advice: return to your village and figure out who put the curse on you...and fix it. Animism, pure and simple...but from a doctor? Go figure. Andrew asks if we can take some extra time to address the issue--I need no convincing, but he tells me how critical a moment this is in terms of the temptation for folks to slip back into the animistic beliefs that have held sway in these parts for millenia. "If they go through with this, someone gets killed," Andrew tells me. We find the young man sitting beside the airstrip surrounded by people listening to his story. His name is Anius, and we ask him to come over to the airplane. Andrew asks him "Have you given yourself to Jesus?" "Will you completely forsake going to the spirits and trust only in God to heal you?" Andrew shares some more with Anius about his only hope being in Jesus. We place our arms around him. "Man, he's hot," Andrew says to me in English. I feel it too. He's racked with fever. For the next 15 minutes, six or seven of us lifted Anius up to Jesus and asked for victory over evil and for healing for his body. Andi, the pastor of the church in Omban, is the last to pray. Andrew and I climb back in the plane and fly over the mountains to Okbap. Andrew is shaking his head and telling me how much he appreciates the airplane--he's made the hike between these two villages before on foot. I ask him how long it took him. "Four days...and I was a much younger man then." 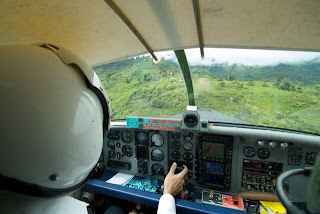 We touched down on Okbap's steeply sloping airstrip 12 minutes after departing Omban. My math skills aren't anything to write home about, but I figure that's 3 minutes of flight time for each full day of walking. "preach the kingdom of God and to heal the sick"
Andrew, a modern day disciple of Jesus...striving to follow these ancient instructions of his Master...under the wing of a Pilatus Porter at the top of the airstrip in Omban.